I’ll admit that when I first saw this I snickered – potty humor, you know. 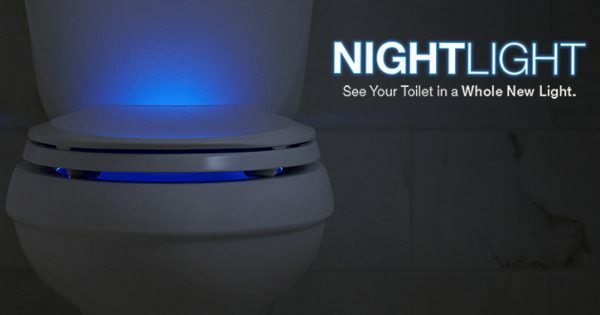 But I have to admit the Nightlight toilet seats from Kohler could provide an important function in households with kids or anyone who needs a little extra visual help in a dark bathroom. I don’t like leaving a bathroom light on in the master bath because it leaves the bedroom too bright. Turning on the bathroom light in the middle of the night wrecks your night vision and makes it hard to find your way back to bed. And every kid knows that monsters can’t hide in the light, so you need some sort of light in there. Kohler has solved the dark bathroom problem by adding dual night lights to their Cachet Q3 and Reveal Q3 toilet seats. One blue LED shines up onto the tank when the seat is down to brighten the dark room. Lifting the seat causes the second LED to light up the bowl, which could help youngsters improve their aim. It uses four AA batteries, and Kohler says it can run for up to six months per set. The first night, you’ll need to turn the lights on, and this will program the lights. They’ll then turn on at the same time every night and burn for seven hours before turning themselves off. There’s no price listed in Kohler’s announcement, which you can read at the Nightlight link above. That’s kind of neat even for houses that don’t have boys 🙂 We have a night light that’s really too bright. I’ve thought about getting a red bulb for it as red light at night isn’t supposed to mess with your sleep patterns. I live alone so the $2.49 night light in my bathroom is all I need. Also, it makes it easy to see the bathroom as I get up from the bed. I don’t think this toilet would do that. I’m also a little wary of any sort of electric device around water. @Sandee At least it’s just batteries for the power. I wouldn’t like anything that needed to be plugged in so close to water, either. Next we just have little tea lights floating around in the bowl – BMAO!! !